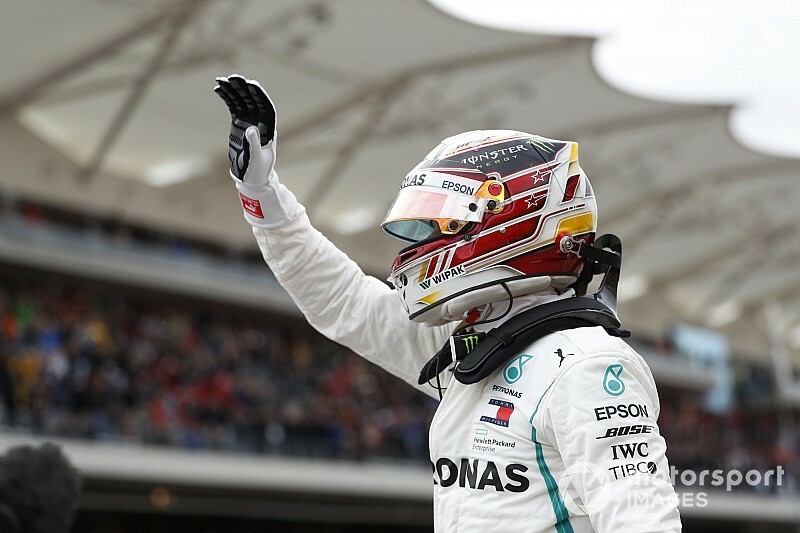 Lewis Hamilton claimed his ninth Formula 1 pole position of the season in qualifying for the United States Grand Prix, while title rival Sebastian Vettel will start fifth. Vettel was Hamilton's closest challenger on pace in qualifying, but has a three-place grid penalty for speeding under the safety car during Friday practice. Hamilton had the advantage after the first runs in Q3, but came under attack from both Ferraris on his second run. Kimi Raikkonen, who will start alongside Hamilton on the front row, briefly took top spot with a lap of 1m32.307s, only for Hamilton to retake top spot by 0.061s. Vettel then completed his lap, a 1m32.298s, to split the pair, subsequently saying over the radio that he tried everything he could to beat Hamilton. Valtteri Bottas was 0.379s off Hamilton in the second Mercedes and ended the session fourth fastest ahead of the Red Bull of Daniel Ricciardo. Both Mercedes drivers, Vettel and Ricciardo will start the race on the supersoft Pirellis having used that compound to set their Q2 times – although Raikkonen used ultrasofts. Esteban Ocon was best of the rest in sixth place for the Racing Point Force India team, just ahead of Renault driver Nico Hulkenberg. Romain Grosjean was eighth ahead of Sauber driver Charles Leclerc, with Sergio Perez 10th in the second Force India. Renault's Carlos Sainz was the quickest of those eliminated in Q2 in 11th place after failing to capitalise on teammate Hulkenberg, who had a lock up into Turn 1, not improving on his second run. Sainz set his best time of 1m34.566s to close to just two-thousandths from Hulkenberg and complained of "oversteer in the last corner, I don't know why" costing him. Haas driver Kevin Magnussen was 12th after also failing to improve on his second run thanks to losing time in the first sector. Toro Rosso pairing Pierre Gasly and Brendon Hartley, who will both drop to the back of the grid thanks to Honda power unit change penalties, did not set times during Q2 and ended up 13th and 14th respectively. Because both did at least take to the track, they were classified ahead of Red Bull's Max Verstappen. The Dutchman could not run in Q2 after a failure in the right-rear corner when running over an exit kerb in the first segment of qualifying. McLaren driver Fernando Alonso was 16th after being eliminated in Q1 by Hartley's last gasp improvement. Alonso was 0.441s up on Hartley after the first sectors of their finals laps, but the Toro Rosso driver turned that deficit into a 0.088s advantage over sectors two and three to jump the McLaren. Alonso will move back ahead of both Toro Rossos on the grid once the penalties are applied. This put Alonso ahead of Williams pairing Sergey Sirotkin and Lance Stroll in 17th and 18th respectively, with 0.118s separating the two. Sauber's Marcus Ericsson briefly elevated himself out of the drop zone in the final flurry of Q1 laps, only to be shuffled back down to 19th by the chequered flag. Stoffel Vandoorne brought up the rear in the second McLaren, lapping two tenths slower than Ericsson.